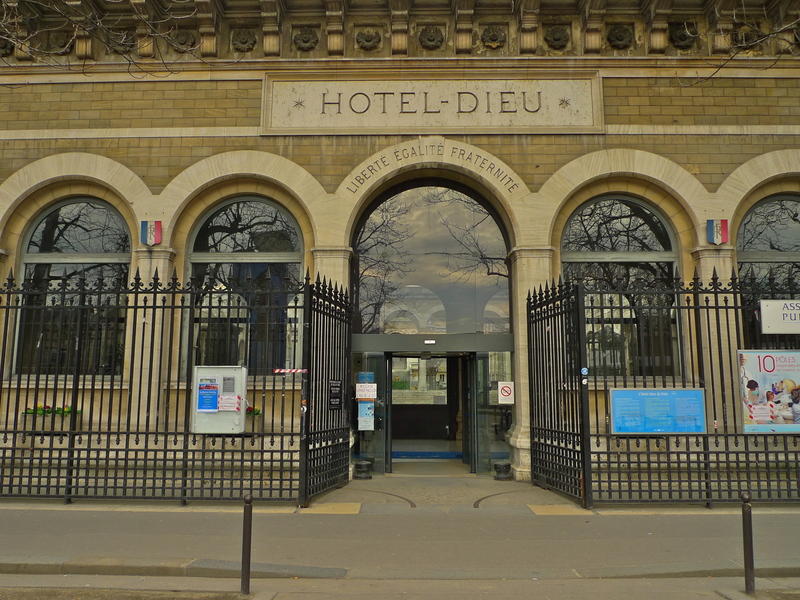 THE HÔTEL DIEU was founded in the middle of the 7th century, which makes it the oldest hospital in Paris. It sits on the Parvis du Notre Dame alongside its more prestigious neighbour, the Cathédrale Notre Dame de Paris, which was founded some four hundred years later. 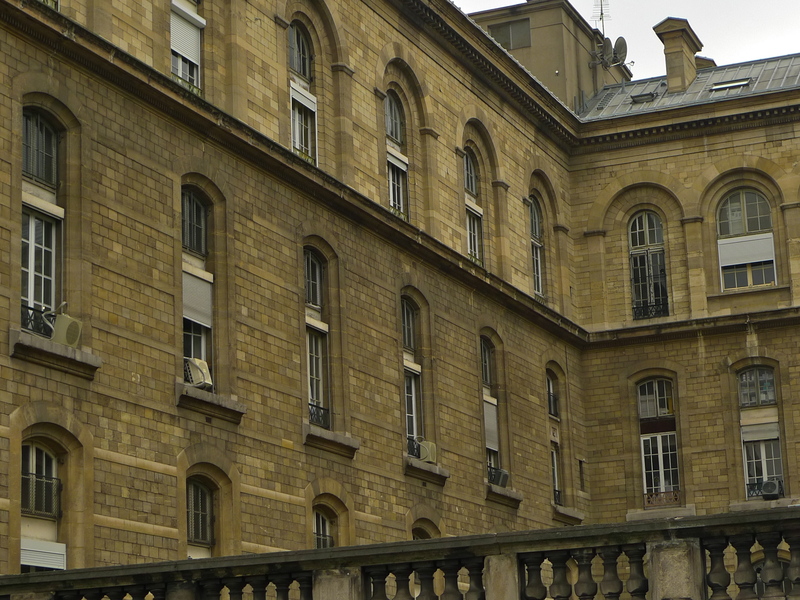 Originally, the Hôtel Dieu was situated on the other side of the Parvis next to the river Seine. During the Middle Ages it grew in an unplanned and rather chaotic way and by the 17th century it had spilled over the river occupying two bridges and a parcel of land on the Left Bank. Of course, to say that the Hôtel Dieu was founded as a hospital is not exactly true; there were no hospitals as such in the 7th century. It did cater for the sick after a fashion but it was founded more as a refuge for the poor and it continued to be a refuge for Parisians until the 17th century. By this time though it had gained a terrible reputation and by the time of the Revolution in 1789, a quarter of those admitted died often of diseases contracted within its walls. 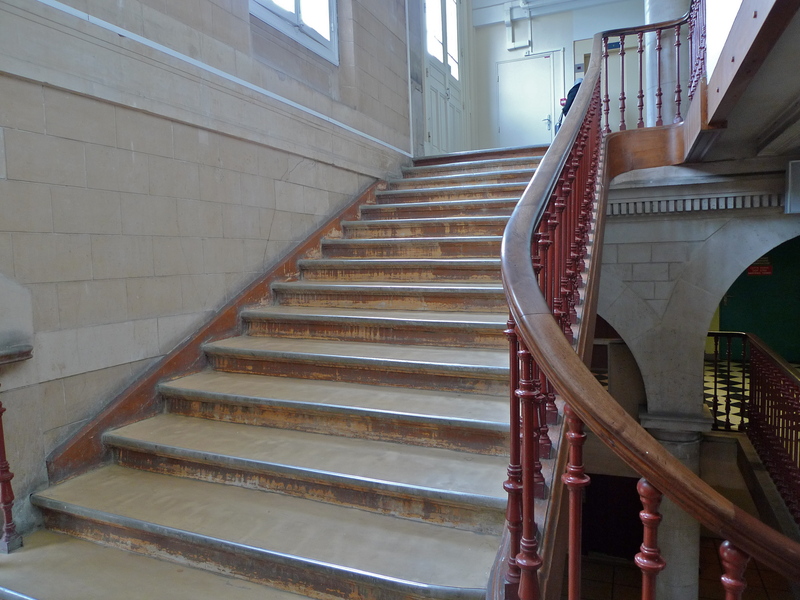 It was only in the mid-19th century when the hospital moved to a new, purpose-built home on the other side of the Parvis, the home that it occupies today, that it began to shed its reputation as a disease trap and became a place where people might be treated and even cured. 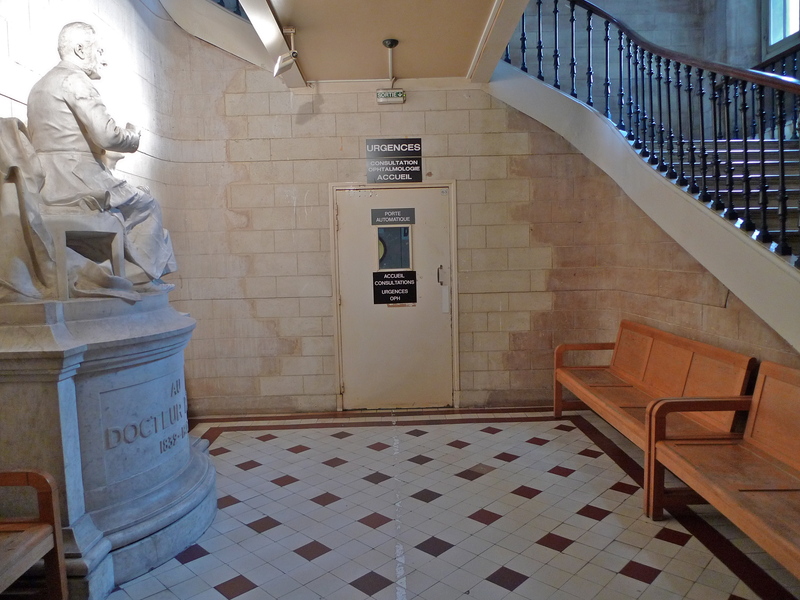 Today, the Hôtel Dieu has 350 beds and it’s the primary casualty centre for emergency cases in the first nine arrondissements in Paris. 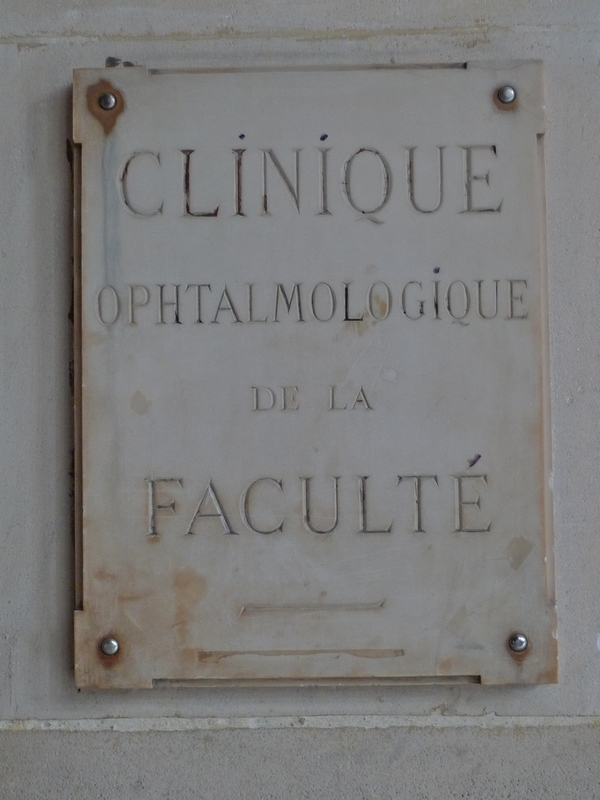 It also specialises in research into and the treatment of diabetes and it has a major ophthalmology department, which caters for ophthalmic emergencies, surgery and research. 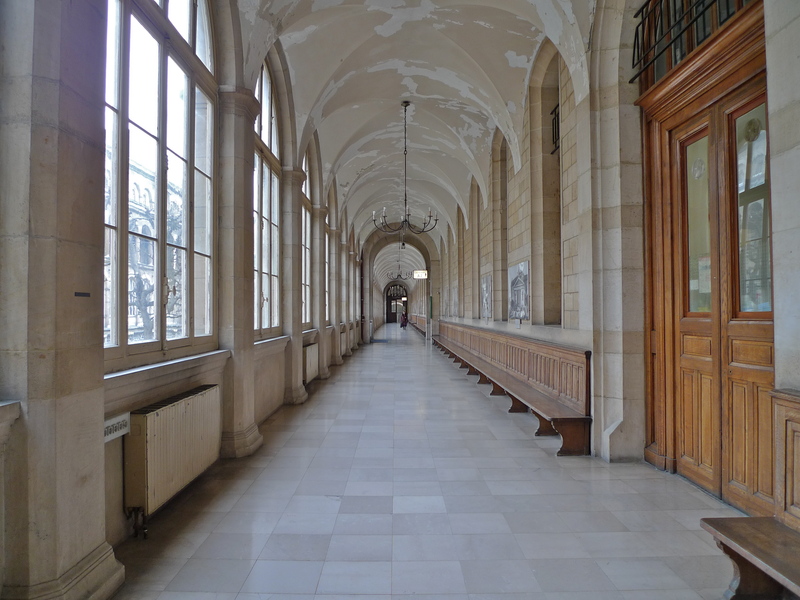 Recently, I went to have a look at the Hôtel Dieu. From both the outside and the inside it has the feel of rather a cold, unwelcoming place. 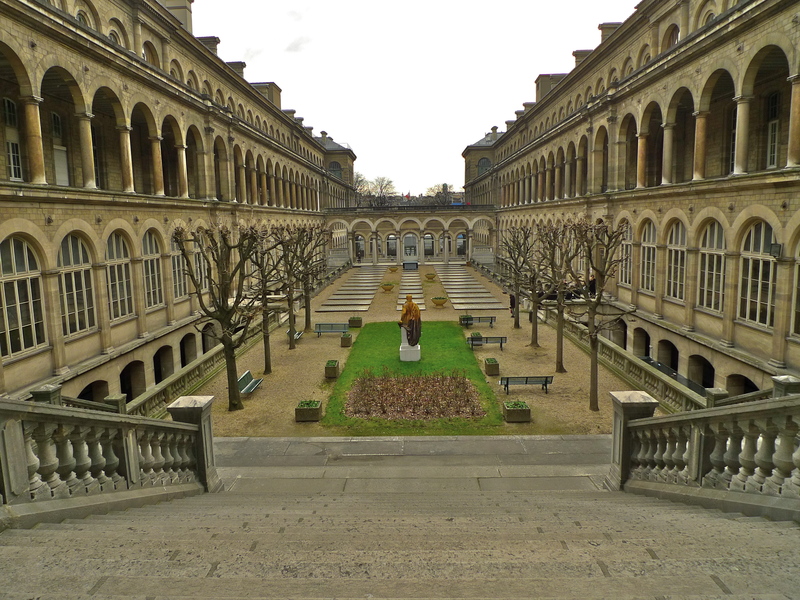 Like most 19th century hospitals its buildings are arranged around a central courtyard connected by colonnaded walkways. Beneath these walkways are long, seemingly endless corridors, which have a rather haunting feel to them. 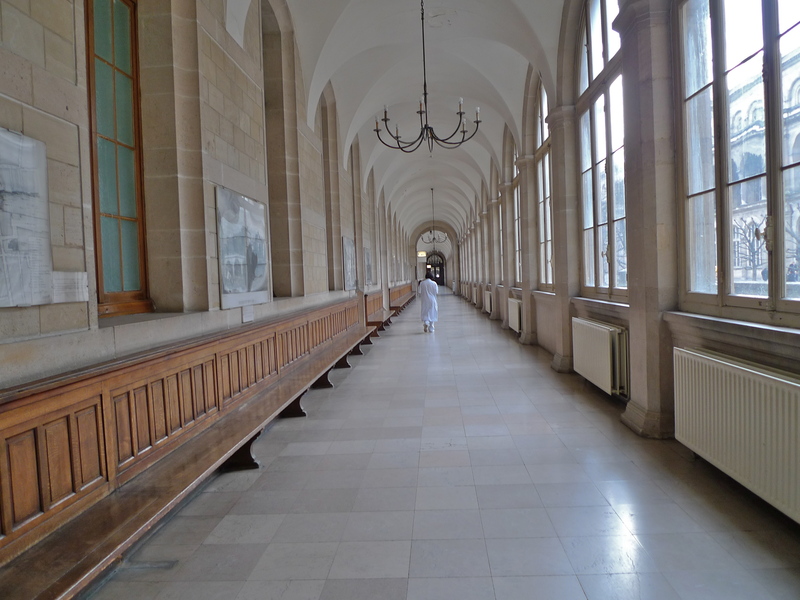 Whilst these long corridors have a curious haunting elegance about them and the hospital wards themselves are perfectly clean and functional, the spaces in between are rather shabby and have a run-down feel. The entrance to the ophthalmic emergency unit for example doesn’t really inspire confidence even though it’s a state-of-the-art facility. 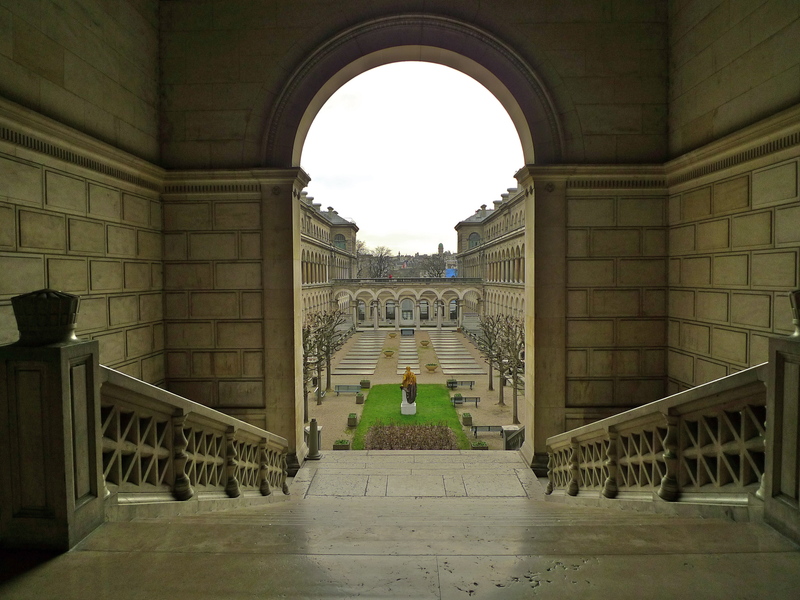 Regular visitors to this blog will know that, whilst I have a passion for the city of Paris, I have an even greater passion for its sounds and I found the sounds inside the Hôtel Dieu simply fascinating. To illustrate that, I offer you two sound pieces, both recorded inside the hospital but both recorded in different ways. Both illustrate how sound can describe the atmosphere a place and create images equally as powerful as words or pictures. The first piece is a soundwalk inside the hospital. I simply recorded as I walked along the corridors and in and out of any door that would let me pass. I didn’t of course invade any private areas – the emergency room, the wards or the laboratories, I simply kept to the public spaces. In the first piece I walked through the hospital discovering the sounds. In the next piece, I sat in one place and let the hospital walk past me. 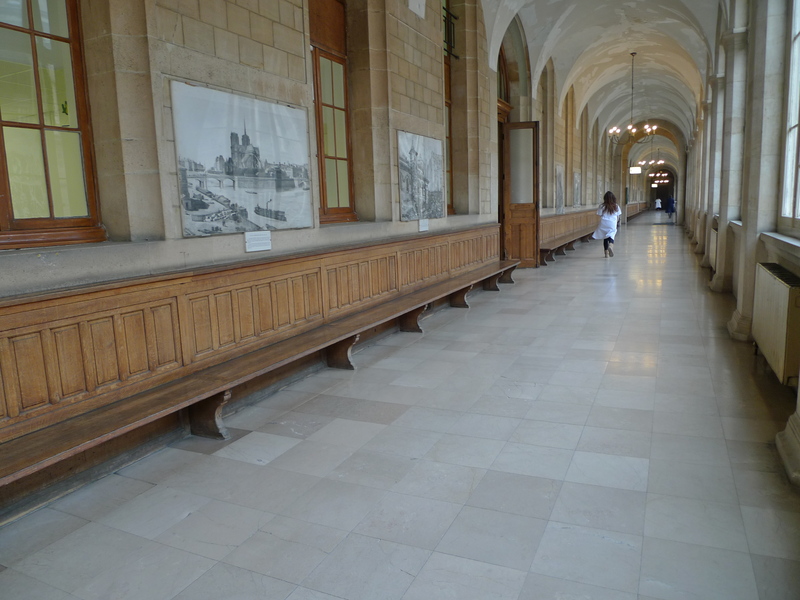 I sat on a long wooden bench in the seemingly endless corridor shown above, outside what I discovered was the bloc opératoire which to my ear at least sounds much more elegant than the operating theatres. If you listen carefully, amongst other things you can hear the soft tread of operating theatre staff dressed in hospital scrubs and white coats returning to work after lunch. Both these sound pieces illustrate the everyday sounds of a busy hospital, sounds that would go largely unnoticed to the ordinary visitor or to someone with more important things on their mind. People often ask me why I record sounds like these and my answer is always the same. For most of our history we have used artefacts, architecture, pictures and words to create a vision of our past. It’s only in the last ten seconds or so on our historical clock that we’ve been able to capture and archive sound. Almost all our sonic heritage has passed by completely unrecorded. In the 16th century this hospital catered for some 3,500 patients at a time often with four or more to a bed. In 1832 it was overwhelmed with victims of the great cholera outbreak. We have written and pictorial evidence of what the hospital was like during those times but we have none of its contemporary sounds to listen to. Sitting on my long wooden bench in a seemingly endless corridor I was not only able to listen to and record today’s sounds of this place but to create a record of these sounds for others, now and in the future, to explore. I think I may even have been able to hear faint echoes of this place’s past. As a final note, I have to record that the Hôtel Dieu has an uncertain future. 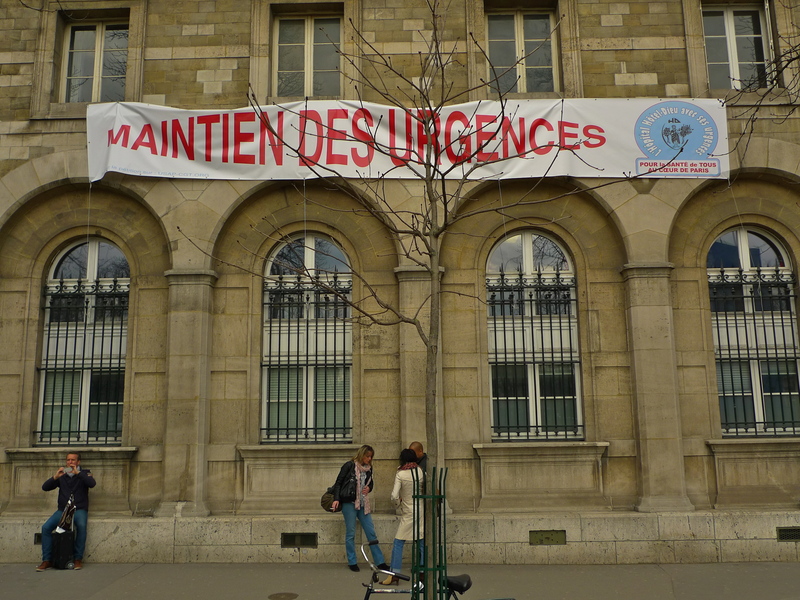 Thanks to a restructuring of l’Assistance Publique Hôpiteaux de Paris, the body that oversees the hospital, changes are afoot. There are proposals to close the emergency department and to change the hospital into a Hôpital Universitaire de Santé Publique, in effect, a teaching hospital which will take walk-in patients without appointment. That’s why there are banners up on the hospital walls and why the CGT union were collecting signatures for a petition on the day I went. If these changes come to pass then maybe the sounds I recorded in the Hôtel Dieu will become more important than I thought – a genuine piece of history captured before this hospital as we know it disappears. thank you for this post! We just learned about this hospital in my history of medicine class so I sent the post to my prof! very interesting. I’m pleased that you found this post interesting and even more pleased that it helps with your studies. Thanks for letting me know. I hope that the sounds help you to feel the atmosphere of the hospital. Whether with the eyes or ears you could easily feel as though you had fallen back a few centuries into the past. The sharp staccato steps of your first recording are nicely contrasted by the smoother sounding French language in the second. Great recordings for a great story. Thanks JD. Sounds like these fascinate me. They’re sounds that would pass by completely unnoticed by those with other things on their mind but if you have the time to stop and listen they’re sounds that speak and have a story to tell. it’s beautiful, but scary somehow, did you notice like kids talking quietly in the recorded voice? is this the one that operate as a hotel too? No, it doesn’t operate as an hotel. In French the word ‘hôtel’ can also mean a ‘public building’ which is what it means in this case. Thank you very much for your post. I once stayed in this hospital as a young student in Paris in 1999. It was indeed a rather intimidating place to recover. I am trying to write some accounts of my time in Paris that year and your pictures bring back a lot of memories. Fantastic post! It’s intriguing to think of what you said about the latest 10 seconds on our historical clock. Makes your quest even more noble! Thanks for the additional info on the hospital’s past and present, very enlightening! I hope you had time to meet with hmunro during her recent visit a few weeks ago? She always speaks so highly of you. The Hôtel Dieu is certainly a fascinating place but it’s very sad to see it winding down towards closure. I still go and record the fascinating sounds in those long corridors but each time I go I know that I’m recording the death of an institution. Glad to hear it. Heather certainly has a knack for making friends in Paris and making the most of her time here! Perhaps I could join you one day on one of your walks? I’m sure I would find it quite interesting. Yes, that would be great. If you contact me via my website http://soundlandscapes.eu we can arrange to do a soundwalk. I look forward to it. Fascinating study of a moment in time. As if the echoes of the past were joining today’s murmurs.